Vol. I is a profound work of art—a successful book and film series featuring significant accomplishments of African descendants since the dawn of civilization, exposing distortions and cover-ups of those achievements, analyzing examples of African American success stories, and offering a process for individual healing, hoping and cross-cultural understanding. 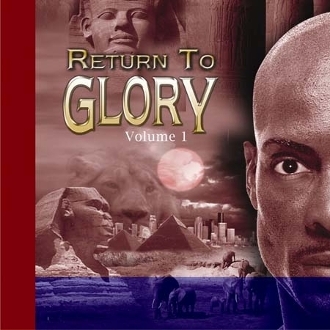 African Americans (young and old), Non-African Americans and people of African descent from other cultures have enthusiastically received the message of the Return to Glory book and film. The universal connection continues with the Return to Glory, Vol. I , the first in a series of musical compilations that includes carefully selected inspirational Gospel and Contemporary Jazz/R&B rhythms. The album features soul-stirring performances by prominent Jazz and Gospel artists such as Grover Washington Jr. , Jazz Crusaders , Duke Ellington, Allen & Allen and Wayman Tisdale. Notable tracks include America's Cry— a beautiful and haunting serenade, Feminine Fire (Lamont O'Neil)— a special dedication from Black African American men to Black women, Standing Tall (Jazz Crusaders) is a cool harmonic Jazz tribute to the struggling young Black man, and Shining Star Interlude-featuring Grover Washington Jr. is a solid, heartfelt instrumental dedicated to the late brilliant composer/saxophonist in relation to the Return to Glory theme and destiny of peoples of African descent. Return To Glory, Vol. I is a project that will forever change the way the world moves.